Churachandpur, Jan 22 : The Kuki community today decided to launch a “quit Kuki land” movement from January 24 to push home the demand for a separate Kuki state carved out of Manipur’s hill districts. They also resolved to “sever ties” with the Indian state by burning the Tricolour on Republic Day. 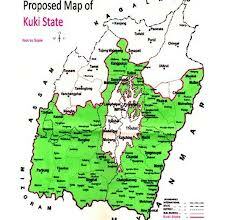 The resolution to intensify the agitation over the demand for creation of the 12,958sq km Kuki state comprising Churachandpur and parts of the four hill districts of Senapati, Ukhrul, Tamenglong and Chandel was adopted at a meeting organised today by the Kuki State Demand Committee at Vengnum community hall here. More than 800 Kuki village chiefs attended the daylong meeting, during which the demand committee initiated a plebiscite on the issue of state creation and also decided to resume the highway blockade on Thursday from 5pm. It was also resolved that celebration of Republic Day would not be allowed in Kuki areas. The “quit Kukiland” movement is aimed at forcing all government functionaries, both state and central, to withdraw from Kuki areas, and was spurred by reportsabout the Centre’s plan to grant a pan Naga development council to NSCN (I-M) as part of its agreement with the rebel outfit. The Kukis’ territory claim overlaps with that of the Nagas, as the NSCN (I-M), too, is demanding integration of Chandel, Senapati, Tamenglong and Ukhrul districts with Nagaland. The demand committee’s general secretary, H. Benjamin Mate, told reporters here today that they had decided to intensify the agitation after the Union home minister Sushil Kumar Sindhe refused to meet a delegation of the committee that went to Delhi last week to apprise him about the need to settle the Kuki issue before getting into an agreement with the NSCN (I-M). He said the NSCN (I-M) continued to claim large parts of Kuki territory as Naga traditional land. Mate said the Centre had also failed in its promise to start a dialogue with the demand committee on the “Kuki state” after the Parliament session ended. “The Indian authorities are advised to withdraw from Kuki territory and they will be held responsible for any untoward incident arising out of their failure to comply with this resolution of the Kuki people,” the resolution said. The demand committee had suspended its public blockade on December 14, a day before the Indian-Asean car rally passed through Manipur, after the Centre promised to initiate talks over the demand for a Kuki state. The blockade had begun on November 17. The resumption of the public blockade will snap road communication between Imphal and the five hill district headquarters.